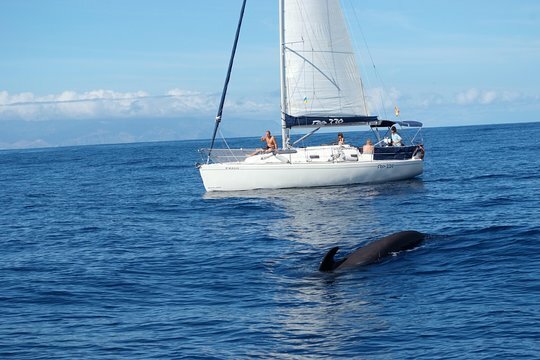 The seas near Tenerife are well known for their whale-and-dolphin sightings, and this small-group cruise from Playa de las Americas lets you see them from an uncrowded yacht, without fighting off the crowds for views. Plus, scuba equipment is provided for you in case you’d like to snorkel in the waters and search for turtles. Hotel pickup and drop-off, snacks, Champagne, and unlimited other drinks are included for your convenience. 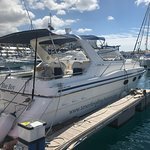 Start with hotel pickup in south Tenerife, or choose to travel independently to Puerto Colon marina in Playa de las Americas. 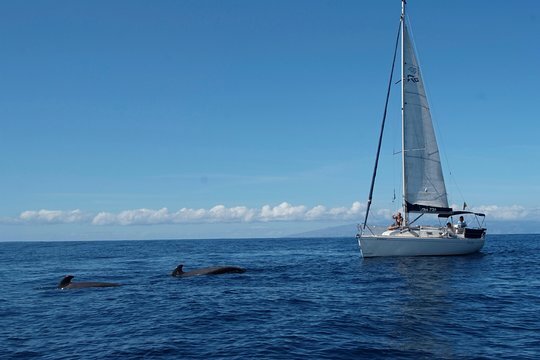 Meet your skipper, board the deluxe yacht, and relax as you sail or motor to an area where pilot whales are usually seen. Absorb the breezes and coastal views, and as you cruise, savor a glass of Champagne, fresh sandwiches, and unlimited beer, wine, and sodas. Keep watch for dolphins, and after cruising for about 30 minutes, watch for groups of whales, sometimes including mothers, fathers, and their young. Learn about local marine life from the skipper, and after your whale viewing, cruise to a secluded bay frequented by turtles. Drop anchor here and opt to swim from the yacht, perhaps snorkeling using the supplied equipment to see turtles. Lastly, enjoy more sandwiches and drinks before cruising back to dock, where your trip ends on disembarkation or with a hotel drop-off. by surprise saw a lot of dolphins !! and as it is a small boat ... the fish come swimming very close to the boat... My daughter of 8 was in 7th heaven ! Excellent great communication picked up at hotel. Trip was superb. 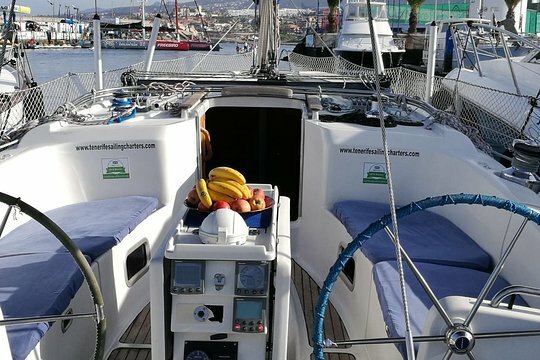 Small group on board with all nationalities. Snacks and drinks were just right. 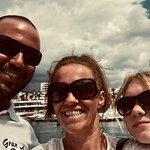 Very lucky we saw dolphins and a few whales. Just a great mental massage. Definitely do again. 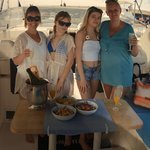 Get quick answers from Whale and Dolphin Watching Sailing Boat with Drinks, Snacks and Swimming Time staff and past visitors.